There's something about this headline that makes you just want to Laugh out Loud!!! 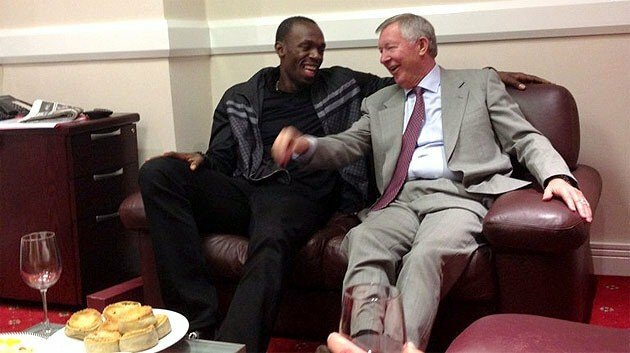 - Usain Bolt to Feature in Manchester United Friendly Against Real Madrid??? Probably funny because i imagine Bolt running around the field with the ball and no one able to catch him.. Crazy.. i know. Bomboclat Man - You know me fi Run pass Rooney? Before these red devil fans get all Hot and bothered - Let me state that Bold is only Playing for the Manchester United Annual Charity Game Next year against the Spanish side. Bolt who is a Huge Manchester United Fan recently had a chance to meet all the stars at Old Trafford.